Don’t worry, chicken. This isn’t about you. You’re good. 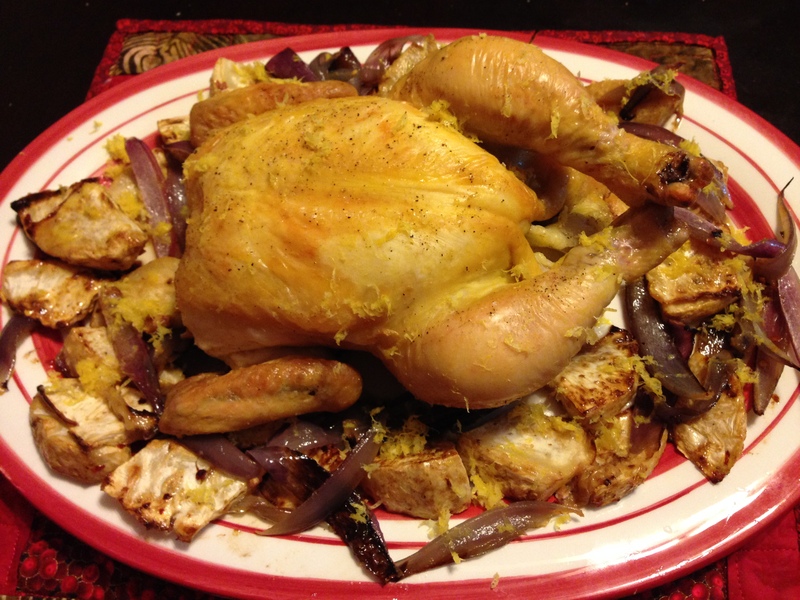 Let’s start with the totally uncontroversial part of this delicious Sunday meal: the chicken. 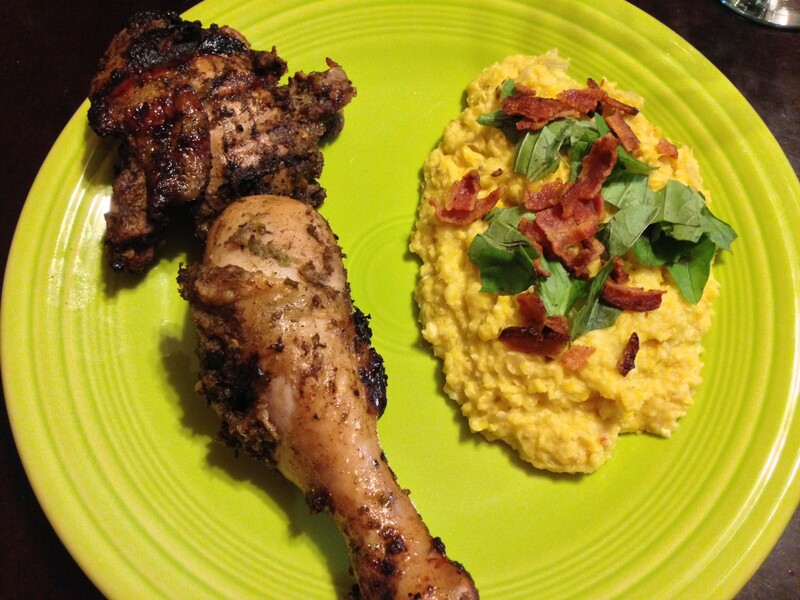 This chicken recipe is easy and delicious. The ingredients are fully bizarre. 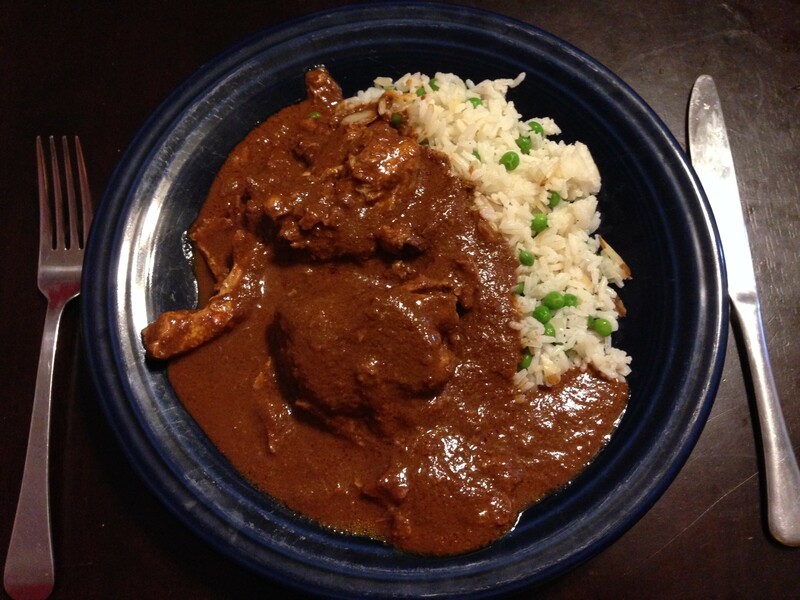 If you can name me any other food besides jerk chicken that has you combining hot peppers with allspice, please do. This was super hot. D told me that the vapor of marinade hitting heat on the grill was giving him coughing fits. I believe it. I had one fingerful of the marinade right after it was done and my eyes were watering. Keep in mind, please, that this was all with a jalapeno pepper because we couldn’t find a habanero or scotch bonnet pepper at the store. I can’t imagine how much hotter this could get. The chicken was awesome and that is that. The corn pudding was also good, but therein hangs a tale, as they say. The directions call for you to grate 8 ears of corn. I really had no choice but to use a box grater for this. I got one ear in to this process and was pretty exhausted. After two ears, my arm was tired and the kitchen looked like a corn cob exploded on it (which it kind of did). After three ears I was getting desperate and losing hope. D suggested that I cut the corn off the cob and run it through the food processor. Fine. Sold. He could have suggested putting whole ears in the blender. I was ready to try anything. Please also note that the coffee maker, in D’s words, looks like a crime scene. 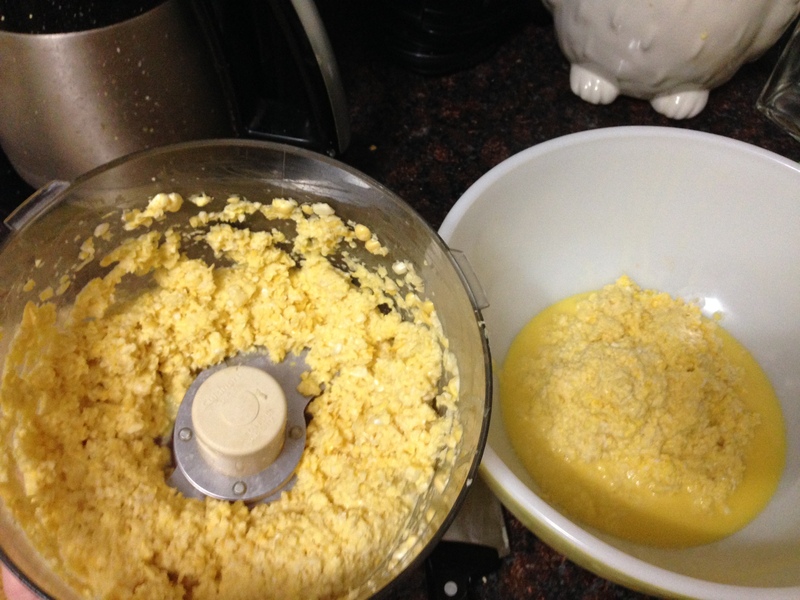 You can see that the one on the right, the grated corn, is considerably juicer than the one on the left. To which I say “Who cares?” Yes, this might have been a little bit more pudding-like, but I have the use of my arm. So that’s that. Even with that modified process, this was still terribly tedious. Was it all worth it? Depends who you ask. I thought it tasted like high brow creamed corn. To me, in a world where canned cream corn exists and, more importantly, where corn casserole exists, this cannot be justified. Oh yeah, you add bacon and some basil to it. Still not enough to justify the hassle. D also thought it tasted like high brow creamed corn, and he thought that was good enough to make it worth the trouble. Who went through the trouble? Yeah, good point there…Grumble, grumble… Also, D doesn’t like corn casserole. For the uninitiated, corn casserole is a mix of a can of corn, a can of creamed corn, Jiffy cornbread mix and some proprietary ingredients to make it hold together which are then baked in the oven. My brother’s girlfriend tops hers with cheese. It’s delicious. D is wrong. If you too think that two cans and a box do not a side dish make, then go ahead and grate some corn until your arm hurts. I, on the other hand, won’t be fooled again. If that doesn’t look bland, adjust your monitor settings. This is my attempt at making a St. Patrick’s Day post two days too late. There’s green from the celery, and it’s a pot, but not a pot of gold. Sigh. I tried. I also give a great big sigh to this recipe. So boring. It’s chicken and rice. I guess it’s not supposed to blow my mind. Yes, it only takes one pot. Whee. Sorry. Maybe I’m not more enthusiastic because my mom went through a three year phase of making chicken and rice for almost every dinner, and I’ve been scarred. Also, the rice wasn’t cooked. That’s probably just a brown rice thing. I think asking brown rice, vegetables, and chicken to all show up at the right temperature and consistency at the right time is too much to ask. I’ve got an Arroz con Pollo recipe from a Williams Sonoma cookbook that is one pot, cooked in the oven, and utterly flawless. The difference? White rice. Happy belated St. Patrick’s Day dear readers. Maybe next year we will have corned beef and cabbage or something. Issue 69 had a feature on using parchment as a cooking method. It had full meals, main dishes, sides, and even breakfast in a parchment. So, here we go. 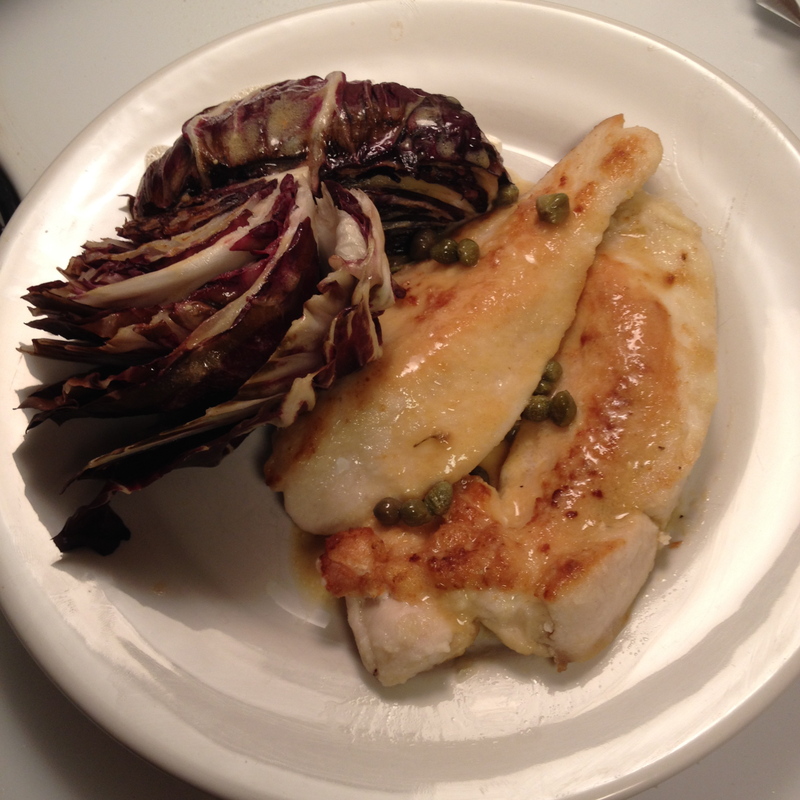 The first recipe I made was for a dinner party with the lovely neighbor. I made the Chicken with Mango and Ginger. Not being a huge fan of spicy foods, I went easy on the jalapeño on my packet. Somehow it managed to impart a small amount flavor without much heat so it worked well for me. 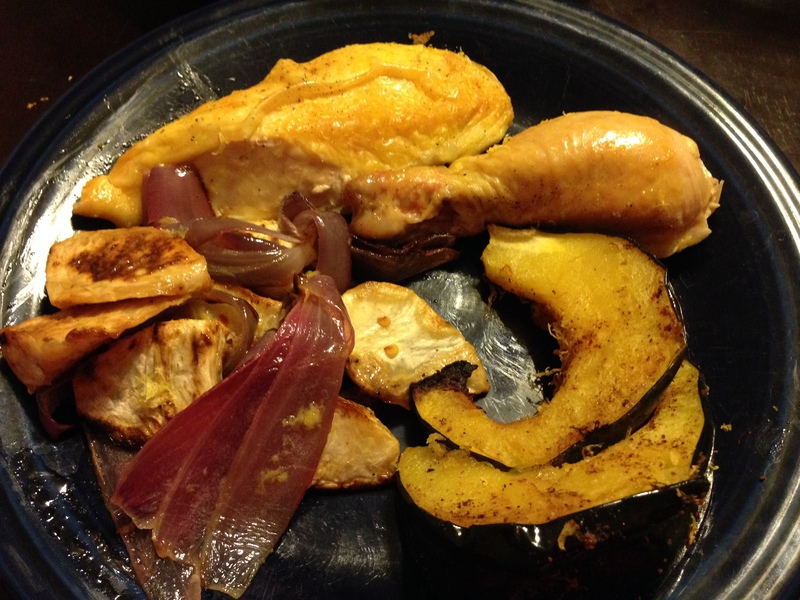 The ginger infused the chicken breast and the mango kept it nice and juicy. (Warning: the mango also made the entire packet pretty juicy so be sure to serve it with something that can absorb a lot of liquid — I went with coconut rice. It was a good decision.) This was a delicious recipe and I will most likely make it again in the future, especially when I need a tropical escape! I also think I might start pairing chicken and mango more often, grilled for example, or in a sandwich. Yeah, it’s a good match. Next, I made the Eggs with Mushroom and Spinach. I’m not going to lie to you. I didn’t think this one was worth the effort of cutting the parchment (let alone any of the actual packaging of the ingredients into said parchment. To be fair, I did make this recipe on a day when I had chills and aches set in by mid afternoon (yep, the flu) so I may not have been a totally unbiased opinion on that day. I definitely didn’t feel any desire to finish eating my packet. I maybe made it through half. It was really plain and more or less boring. And when considering the effort put into fixing it, it just wasn’t worth it. I think I’d skip the parchment next time and just make a scramble. So much easier and the separate parts would work a bit better together that way. 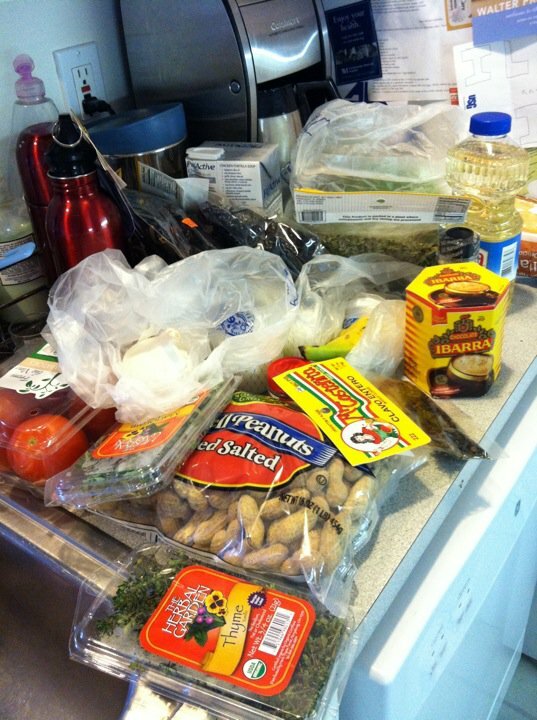 Needless to say, after coming down with the flu, I didn’t do much cooking for a while. I ate soup. Soup from a can. Because I didn’t have the energy to eat anything else. 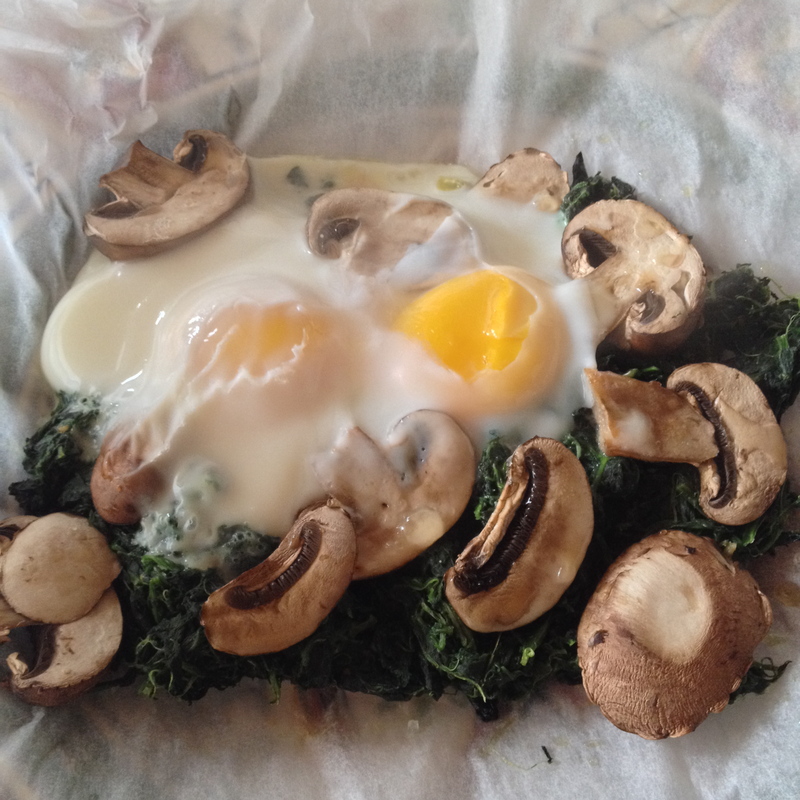 And after the flop that was the eggs with mushrooms and spinach I wasn’t particularly tempted to make another parchment recipe. But I did. 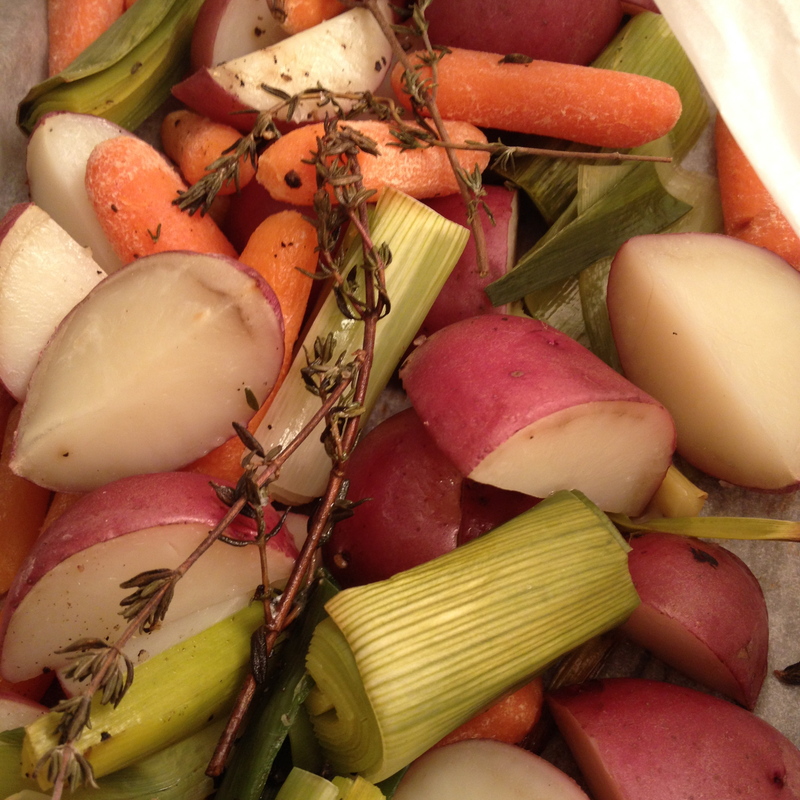 I made the Potatoes, Leeks and Carrots in Parchment. It may not look that thrilling, but it tasted pretty decent. This was another instance where I would normally have just roasted these vegetables together, because vegetables are more delicious when roasted. But! This is the light issue (hence all the parchment) and by using steam trapped in the parchment to cook these veggies, they stayed pretty flavorful and required much less fat than when roasted. In fact, the fat was optional in this method of cooking, so it has its perks. Finally, I made the Broccoli, Asparagus, and Snap Peas in Parchment. And as a bonus, I also made the Herbed Orzo. This is probably the one parchment recipe that I think really benefits from this cooking method. Each of these vegetables is still super flavorful when steamed and don’t necessarily require anything added to make them awesome. We liked it so much that we made it two days in a row. Try it. Trust me. The Herbed Orzo was slightly less exciting, but still an alternative to rice or potatoes so it might be a good thing to add to the mix. The main issue with this recipe is that I found out after I made it that the bear doesn’t like dill. 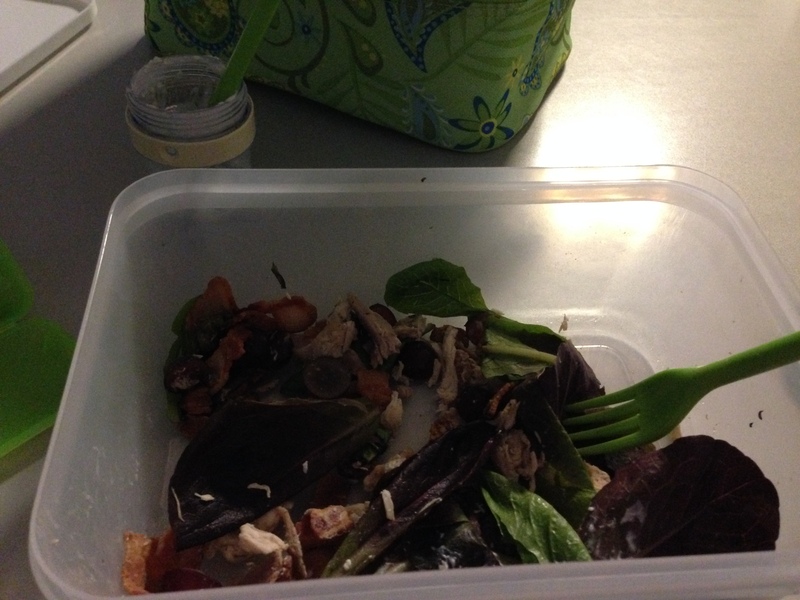 And of course, I had decided that the main herb flavor would be dill… I ate a lot of orzo that week. And now, G will fill you in on the final parchment recipe! Go G!!! This was definitely good and certainly easy enough. 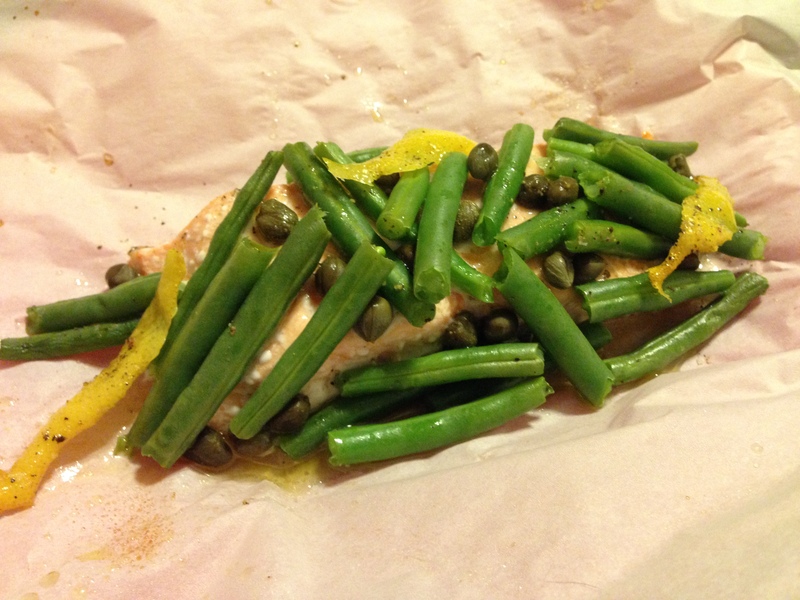 I like cooking things en papillote (that’s French for “No, G, not papillon. You’re thinking of the dog…or the Steve McQueen movie.”), but I will admit it makes me slightly nervous. I don’t think I’d be able to make B’s chicken dish without ruining it by busting open the packet and checking it. 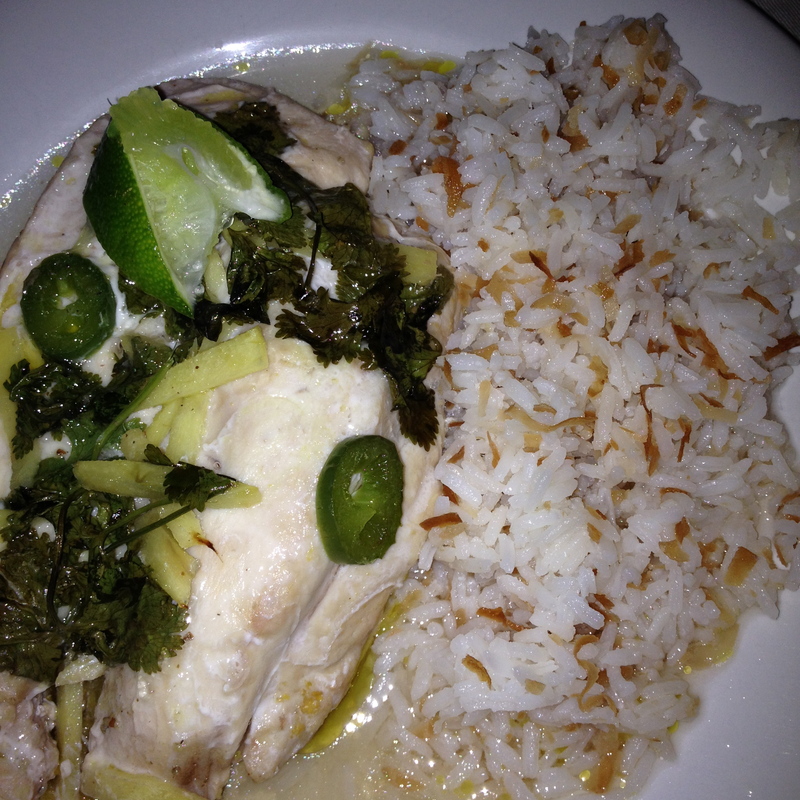 But I grew to love the method by making a very similar dish from a Rachael Ray recipe. She inelegantly calls it Spanish Fish in a Sack. You’ll see that recipe is much more involved than the one in EF here. I think this recipe is a good, simple option. The wide pieces of peel are a nice touch. But…if I’m bothering to make parchment packets, I’m probably going to go with the Rachael Ray fish sack. It’s just too good. Honey and ginger, two of my favorite things. Everyday Food certainly loves their stir fries. I have to admit it is kind of nice. Up to this point, with very few exceptions, I pretty much sliced up chicken or pork, tossed in a bag of stir fry style frozen veggies and added some Soy Vey Teriyaki Sauce (if you’ve never tried it, it’s truly delicious). 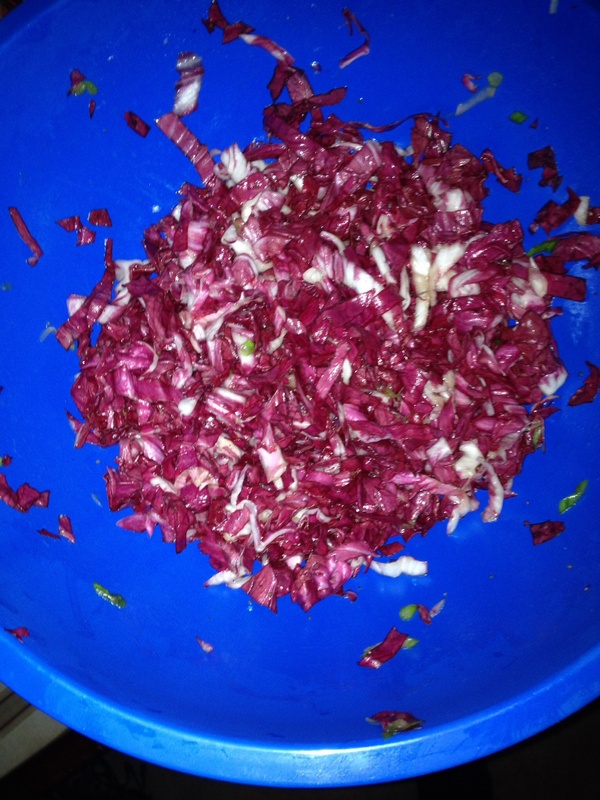 So, here is yet another example of how this blog has taken me out of my comfort zone. Yay! This stir fry was both incredibly beautiful and incredibly tasty. I took the suggestion in the magazine and went with red, orange and yellow bell peppers. It’s not often you have such a colorful meal in the middle of winter. 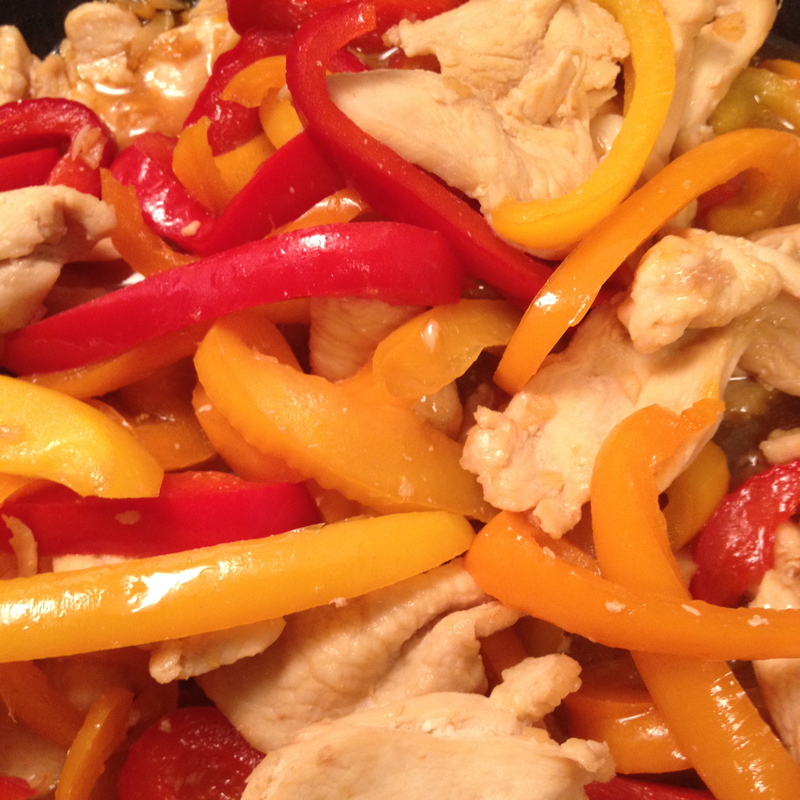 Additionally, the honey and the ginger made the chicken and peppers so flavorful! 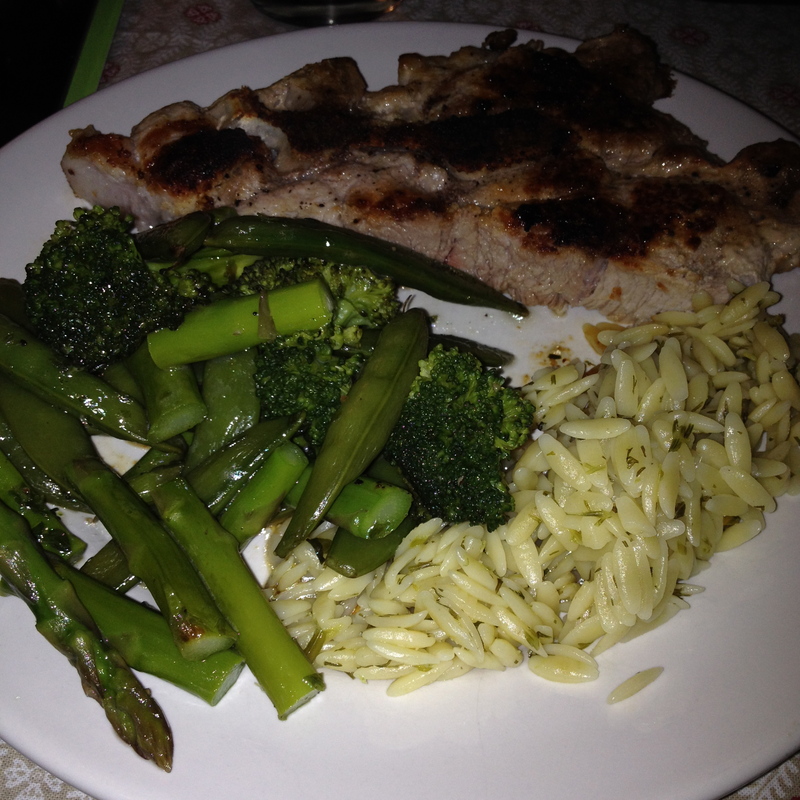 As usual, I served it with brown rice. 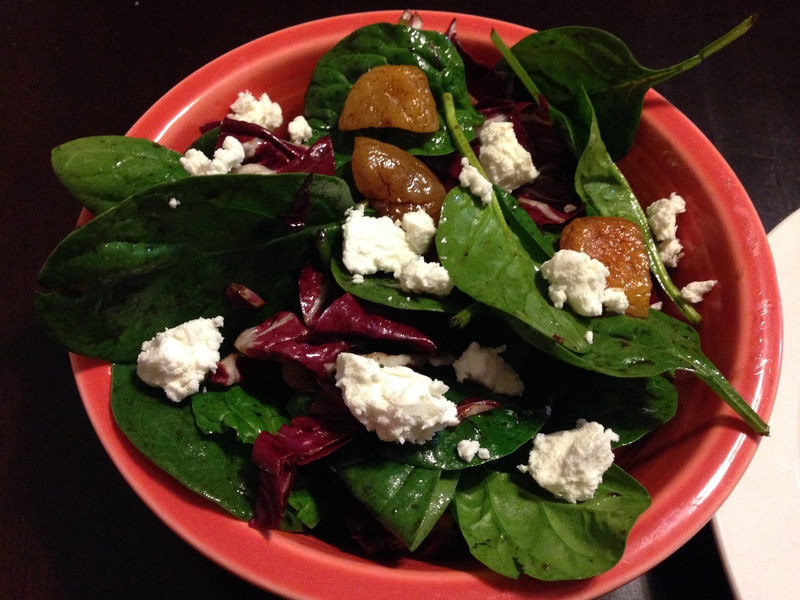 This was a delicious and healthy dinner at the peak of comfort food season. Give it a try! First, brace yourself for some early 90’s cartoon references. Ok, as for the recipe, let me say that these two are absolutely delicious recipes on their own. I would definitely make them again. This is probably the American guy, Fire. The chicken is great. The celery root and onion make for a fine side dish, so you really don’t need to serve anything else. My very best friend chicken fat makes another appearance, so you know I’m happy. The red pepper flakes keep it from being too rich. Nothing gets burned or weird. The acorn squash is spectacular. 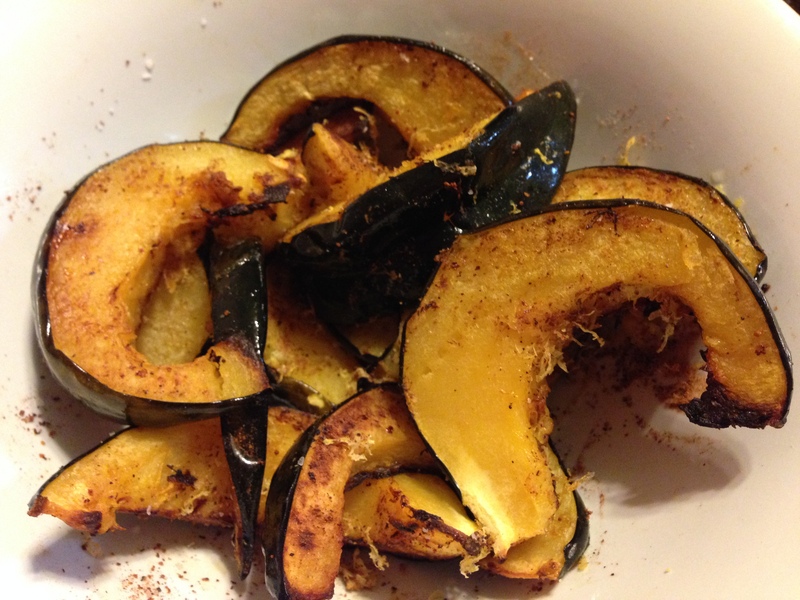 Nutmeg and acorn squash are a natural combo. There’s something wonderfully fall-like about it. I would make this as a side dish for Thanksgiving. The lemon zest is interesting and bright. It keeps the squash from dragging into that too rich territory that Thanksgiving sides often veer into. But that’s not what makes this a great meal. It’s the combination of the two. When their powers combine they create a delicious synergy…a Captain Planet of meat and veggies, if you will. Look it up, kids. Honestly, I don’t know why the magazine doesn’t suggest making them together. They normally don’t miss an opportunity to show you how the recipes can go together. From a cooking standpoint, they are both made in the oven at the same temperature. That’s huge. How many times have you looked at two recipes only to find out that one is cooked at 325 and the other at 400? Too many times. And the chicken cooks for a longer than the squash, but not by too much. That gives you just enough time to prep the squash while the chicken starts cooking. Then there’s the lemon zest. They both get lemon zest on top. 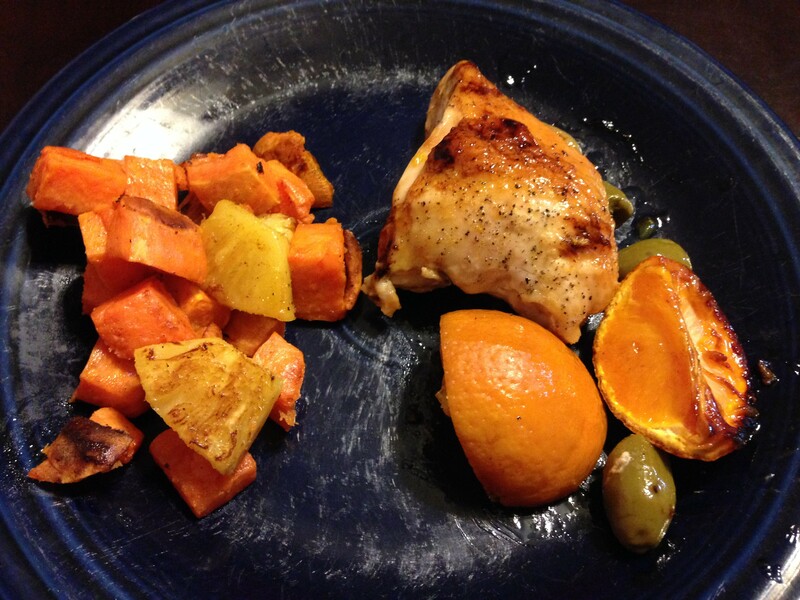 The lemon on the chicken connects the flavor to the lemon on the squash. 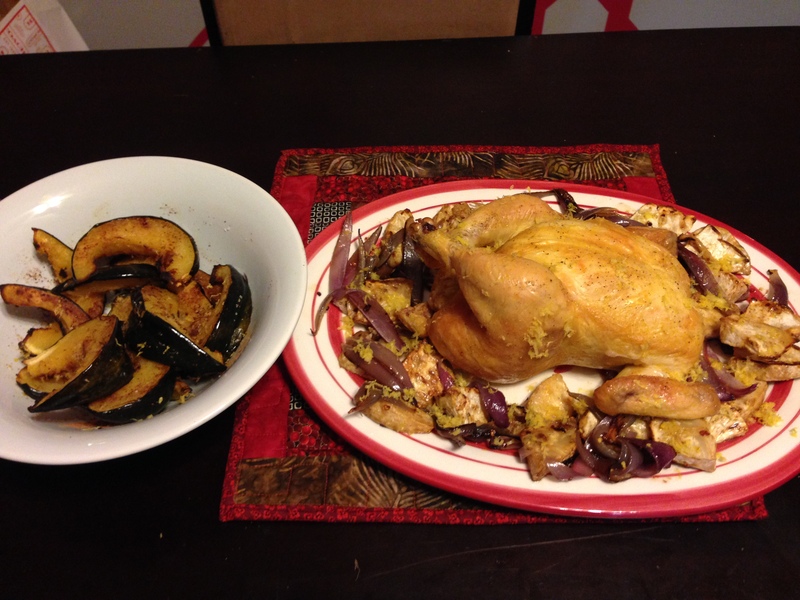 Finally, the squash acts as your starch for the meal, while the chicken takes care of the protein, fat (read: schmaltz for life! ), and aromatics. I recommend these on their own, but I really love them together. My dad hated Captain Planet. That just made us want to watch it more, even though we hated it too now that I think about it. I just realized that I enjoyed the episodes of Captain Planet much more before actual Captain Planet showed up, so this isn’t a great metaphor for this meal. I liked to see all of the ethnic stereotypes try and work it out for themselves. It seemed like a cop out to have Captain Planet swoop in and fix things, even if he was sort of part of them…I guess. Did he exist or were they imagining him as a way to explain their own actions? Does anyone remember if other people could see him? If you want to fall down a wikipedia rabbit hole, here it is. All that aside, the powers of these recipes combined are greater than my confusion about the cartoons of my childhood. I’ve already said I’m a food safety nut. I’m also pretty into fire safety. I don’t want to get into it because it’s sad and this is not the place for it, but there was a fire in my old neighborhood that killed some people in an apartment building and it stuck with me. No, I don’t have an escape plan, but thank you so so so much for putting that into my head. Guess what you’re doing tonight instead of watching TV, D? 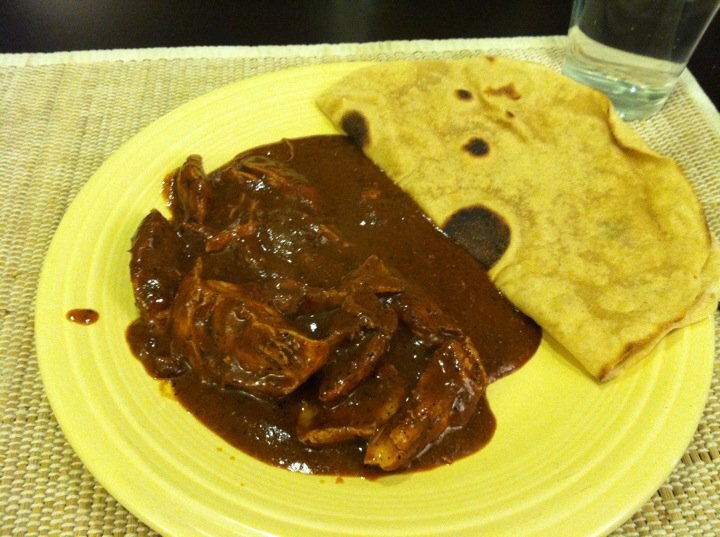 I digress… Because of this fear of fire, I’m nervous about leaving my slow cooker on all day. (I can hear your eyes rolling.) My slow cooker has a big warning in the manual about making sure the slow cooker is filled at least halfway. I suppose they are trying to say that you shouldn’t put a single pork chop into the cooker, crank it to high, and leave it for several hours and expect it to work out. My fear is that a less than half-full slow cooker would cook down, start to smolder, burst into flames that climb up the kitchen cabinets, reach the walls, and engulf the apartment and my kittens in smoke and fire. All this was running through my head as I rushed to get the dinner into the slow cooker and out the door to go to work. 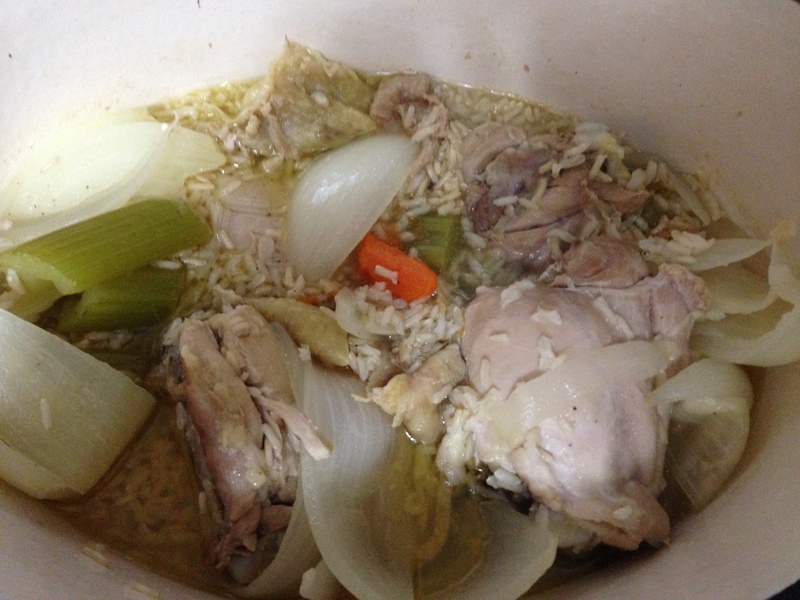 I didn’t leave myself enough time, so I was frantically carving the super cold bird and chucking pieces into the cooker, all the while gauging the crock for whether it had reached the magic halfway mark. I finished loading the carrots and chicken and it was only (ominous music here) 1/3 full. So I did what any sensible person would do, I panicked. I grabbed a pound of carrots from the fridge, washed them and hacked them into long pieces. 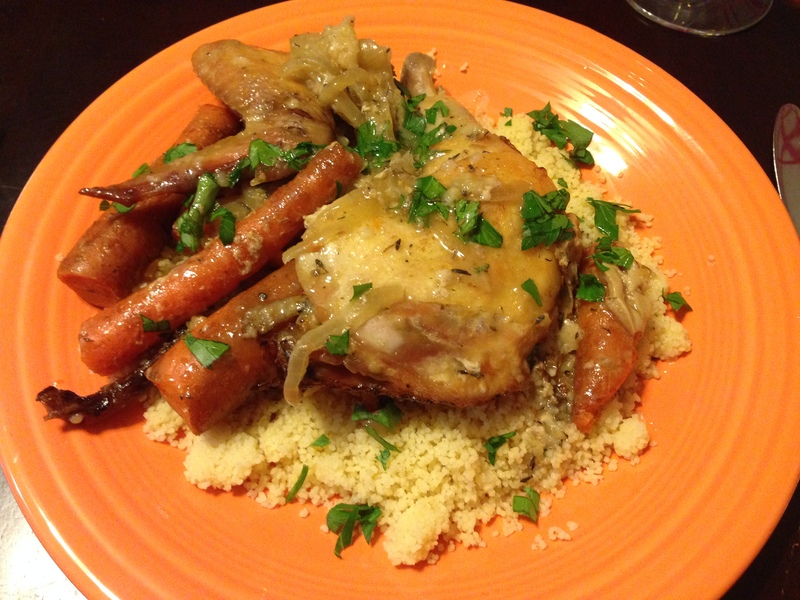 I stuffed the carrots under the chicken pieces to raise the food up to the halfway mark. Then I turned the cooker on and dashed out the door, 15 minutes late to work. That moment of panic turned out to be doubly awesome. First, the house didn’t burn down. Second, those carrots were completely delicious. I mean they were the best part of the entire dish. I’m not just saying that to justify what I did. The lack of a house fire was justification enough for me. I mean that the onions, garlic, and rendered chicken fat all turned those carrots into sweet and savory little flavor bombs. I highly recommend adding carrots to this recipe, even if you’re already at the halfway mark on your crock or if it never occurred to you to worry about such a thing, you foolhardy, devil-may-care, ne’er-do-well, you. Actually, it was triply awesome. Baby J loved those carrots. Panic carrots: one. Fire: zero. B is right, we do need to work on our photography. D made the chicken and I made the side. He bought a whole chicken and cut it up for this purpose. I’m always hesitant to do that. I cut off the legs and wings, start feeling confident, then look at the football-shaped thing in front of me and start panicking. What’s a breast look like? Is that the chicken’s back? Part of my worry stems from a long-running joke between D and his uncle about yella hammers (let’s just say “hillbillies”) liking to eat chicken backs. I’ve always been worried I would serve D a chicken back, and he would die laughing and go call his uncle. Alton Brown once had a show where he explained how to cut up a bird. He said it was like a dinosaur. That’s all I remember. I don’t remember anything why being like a dinosaur is meaningful or helpful in any way. So it’s a good thing D took care of it. He said the only other prep was destuffing the green olives. Also, “pro tip” from D: use the blunt end of a skewer to push the olive stuffing out. He noted that if someone had a bird already cut up and pitted green olives, this would be an extremely easy recipe to prep. It would just be cutting up those tangerines and tossing it. Then you’d have thirty minutes of roast time to get a couple tablespoons of tangerine juice and some honey together. The chicken was very tasty and moist. The warm tangerines were very nice and sweet. The olives were a little spicy, but that’s definitely because the former stuffing was spicy. What kind of olives did we buy that had spicy stuffing? Nowhere on the label does it say anything but “stuffed green olives.” The whole thing is very nice leftover. So when tangerines and other interesting citrus goes on sale in the winter, give this one a try.